Roma Tuscolana railway station (Italian: Stazione di Roma Tuscolana) is a major station serving the city and comune of Rome, Italy. It forms part of the Pisa-Livorno-Rome railway and the Rome-Fiumicino railway. The station is currently managed by Rete Ferroviaria Italiana (RFI). Train services are operated by Trenitalia. Each of these companies is a subsidiary of Ferrovie dello Stato (FS), Italy's state-owned rail company. Roma Tuscolana railway station is situated at Piazza della stazione Tuscolana, just to the southeast of the city centre, in the quartiere (English: district) of Tuscolano. Here's the our members favorite photos of "Railway Stations in Rome". 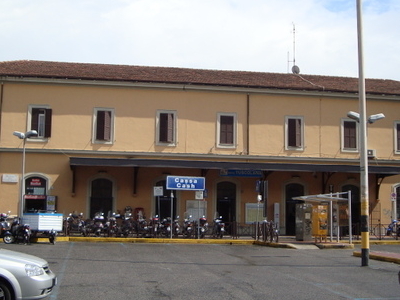 Upload your photo of Roma Tuscolana Railway Station!